There is a struggle being waged for mobile video. Facebook has Instagram and Twitter has Vine. Even though Instagram’s video has a suite of features that make it a more powerful tool, Vine’s popularity persists. Mat Honan of WIRED thinks this has to do with Vine’s off-the-cuff youth culture, it’s dedicated community of minorities, it’s unique cultural force. Reporting from SXSW in Austin, Jenna Wortham sketches the new product from Memoto, a tiny, wearable camera that captures moments every 30 seconds. 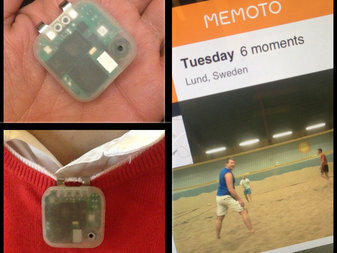 Memoto’s camera hints at some of the issues that will emerge about privacy, ownership of data and social etiquette as automatic lifelogging devices like theirs, or Google Glass, become more prevalent in the wild. There are also larger questions about how secure the sensitive information captured on these devices will turn out to be, or what happens should these companies go out of business, potentially taking reservoirs of personal information captured over the years with them.